In recent months, podcasts have become something of an obsession of mine. My consumption of the medium has hit such a fever-pitch that I’ve begun listening to podcasts to the exclusion of watching television or movies, or listening to music. In fact, my iPod easily spends more time now playing podcasts than songs. Comedy podcasts in particular have really captured my attention; a day doesn’t go by that I don’t listen to one. More than just being funny, something important is happening in the world of comedy podcasting. The podcast is the perfect platform for alternative comics to do what they do best, free of censors and limitations; the infant community allows for a more intimate relationship with fans, as content can be put out and its reception can be seen almost immediately; the radio-like, aural format allows for more believable characters who aren’t tied to what the performing comedian actually looks like. With all of this happening, I thought it only right to start a series covering podcasts; spotlighting specific podcasts, suggesting good entry points for newcomers, discussing the aspects that make each one unique. Clearly, comedy podcasts are the focus for this blog series, but I’m going to branch out, occasionally. So, with that lengthy introduction behind me, let’s get to my first Podcast Spotlight, one of my personal favorites: Comedy Death Ray Radio! Guests, jokes, songs, sketches, characters, games. 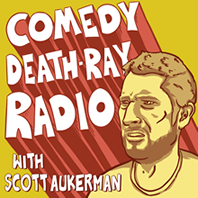 Comedy Death Ray Radio is the radio show(Indie 103.1)/podcast created by comedian Scott Aukerman that is, let’s say, one arm of the burgeoning Comedy Death Ray brand. A sort-of adaptation of the weekly Comedy Death Ray show at the Upright Citizen’s Brigade Theater in Los Angeles, Comedy Death Ray Radio is a mostly-improvisational, talk-radio formatted platform for some of alternative comedy’s best and brightest. Every week, host Scott Aukerman sits down with some of his funniest friends to discuss hot-button topics, listen to some comedy songs, play some games and interview a never-ending revolving door of guest characters. Scott and his guest-hosts interview the characters and really get into their heads, life stories, and skewed perspectives of the world. Fan-favorite characters include comedian Paul F. Tompkins as the Cake Boss, cursed with the gift of second sight after being bitten by a cake bug (not a radioactive one; they just so rarely bite people that no one knows that a cake bug bite makes you psychic). Seth Morris as Bob Ducca, Scott’s ex-step father who was married to his mother for six months and two days when Scott was 33 years old, and who now wants to be a part of Scott’s life since he “failed him” as a father-figure. And James Adomian as … well … where to begin? Californians will want to check out the comic’s particularly skewed take on Huell Howser. And what to say about Tom Lennon’s Li’l Gary? He’s probably best-saved as a “deep cut”. The recent South by Southwest episode featuring Paul Reubens (Pee-Wee Herman) is a double-edged sword. On the one hand, you have Paul — iconic and widely-loved for his Pee-Wee Herman character — talking about his life, career, and creation (and evolution) of Pee-Wee. On the other, there’s Li’l Gary, one of the show’s most polarizing and genuinely obnoxious characters (and that’s coming from me, a fan). One of the best places to get an idea of what the show is about and experience some of its best moments is, appropriately, the Best of 2010 episode. One of my favorite recurring moments on the show is the “Would You Rather…” game. When he asks for them (and only when he asks for them), listeners send in “would you rather this or that” scenarios to Scott via Twitter. The rules are simple: Scott presents to opposing scenarios for his guests to choose between. The floor then opens for questions (not all information is given in the scenarios), and only when the floor is closed may voting begin. Scott then decides a winner based on a thorough and mathematically complex points system. And Bob Ducca’s (again with that guy) list of ailments never fails to please.